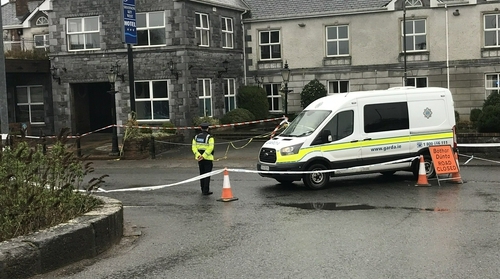 A garda superintendent investigating the arson attack at a hotel in Rooskey last night has said those responsible were in the area for a number of days and had been preparing for the attack. Supt Kevin English said he was deeply concerned about the incident at the Shannon Key West Hotel and the danger posed to local people. He said he was appealing to local residents in the Co Leitrim village to come forward and assist gardaí with their inquiries. Supt English said two security guards and a supervisor had become aware of the efforts to start the fire and significant damage could have been caused but for their response. A forensic examination is to be carried out at the hotel after the second attack in less than five weeks on the building. A window was broken and an attempt was made to start a fire on the premises just after 10pm last night. The alarms in the building went off and security personnel in the hotel called gardaí. Three units of the fire services came to the scene and brought the incident under control. Less than five weeks ago, gardaí had to respond to an arson attack on the hotel, which is still earmarked to become a reception centre for asylum seekers. On that occasion, smoke damage was caused, but last night's incident has now raised serious concern in the area. Gardaí are investigating claims that a fire bomb may have been used. Minister for Justice Charlie Flanagan said he was "concerned and disappointed" at reports of the second fire at the hotel. He said: "This comes just five weeks after the previous fire at the hotel. This pattern of behaviour represents an unacceptable and worrying development and should be condemned by all. A local Fianna Fáil TD has said the fact that it is the second fire at the premises in just over a month is "extremely worrying and totally unacceptable". Eugene Murphy said local residents did not condone this type of activity and were outraged by the fire. Mr Murphy has called on gardaí to maintain a 24-hour presence at the hotel following the incident. Independent TD Michael Fitzmaurice has said the attacks are "senseless" and are not condoned by the people of Rooskey. However both Mr Murphy and Mr Fitzmaurice said genuine concerns local residents have over the use of the hotel for asylum seekers must be addressed.